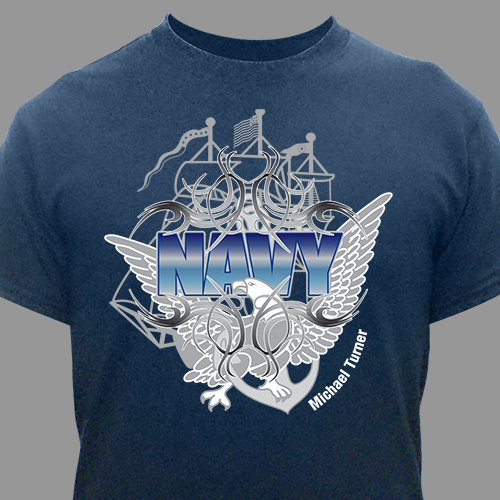 Sail the seven seas and explore new and interesting ports of call in your Navy Personalized T-shirts. A handsome welcome home gift for your favorite Soldier or give one to everyone in the family celebrating the safe return of your strong Sailor. Our Navy Personalized Shirt is available on our premium pre-shrunk 100% cotton Personalized T-shirt, machine washable in adult sizes S-3XL and makes a great gift for Veteran's Day or Welcome Home celebration Your navy Shirt includes FREE personalization! Got one each for my son, who is in the Navy, and his dad. They loved them.